Often mocked for its association with beard-cultivating, battle reenactment types, mead has experienced a resurgence of popularity in recent years. Mead comes in a variety of styles; but we chose to ferment a good, honest everyday mead i.e. the easiest possible one to make. The only drawback with mead-makng is that honey can be quite expensive. We opted for the cheapest supermarket variety (presumably sourced from battery farmed bees in cramped hives) but if at all possible, you should try and source your own local honey from free range bees for a better quality drink. How to make an easy mead. Add approx 3lb of honey (three medium-sized jars) to a litre of water and warm carefully on your stove until dissolved. Its important not to over do it on the heating, as hot honey burns like napalm. When your mixture has cooled sufficiently, pour into a clean demijohn and top up with water. Add a chopped apple, the juice of a zesty lemon and a small handful of raisins, then add 1 teaspoonful of yeast and give it a shake. Fit a bung and airlock, then leave in a warm place. It should take around two months to clear, after which you should syphon into clean bottles and cork. It is said that mead is at its best after SEVEN YEARS of maturing, but we have neither the time nor patience to test this theory. Going by our experiments in Cyser** we suggest cracking open a bottle after a year of maturing. Our motto is; if it tastes good, drink it! A word of warning: Too much mead imbibing will give you HORRENDOUS hangovers. Whilst not on the scale of the infamous ‘Denmark hangover of 1998’ which resulted in a nameless Thirsty Gardener spending three hours curled around a toilet cistern in a Copenhagen railway station, mead hangovers are pretty unforgiving. Go easy. * Note to editor: This fact needs checking. Not sure about the bees bit. Ask Wikipedia. 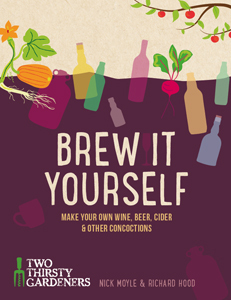 We’ve got more mead recipes in our book Brew it Yourself. If you’re a booze ‘n’ honey fan you’ll also find a recipe for honey ale. If you’re a booze fan in general then there’s loads of stuff to interest you. Available now on Amazon. I am really keen to try this recipe now that my other beverages are nearly ready to bottle – but wondered what size demijohn did you use? Hi Emma, we use a 1 gallon/4.5 litre demijohn. We use champagne yeast and (fingers crossed) have always had a successful ferment. Honey is a bit short on the nutrients that yeast needs, so you may wish to add some nutrient when you pitch in the yeast just to be on the safe side. Hope it all goes to plan…keep us posted! Hello fellow boozing gardeners (or allotmenteers like me). I have just started some Blackberry wine and not too happy with it at the moment, so I am keen to try your Mead wine, does it really take a whole year before I can drink it ? I might be dead by then. You didn’t mention what colour the Demijon should be, I have dark or clear. Hi Graham. We would heartily recommend that you try and wait for a year or more before cracking open a bottle as it will taste ten times* better. And if you die in the meantime, at least your friends and family will have something nice to drink at the wake. That said, there’s no reason why you should’t open a bottle or two before then, just to see how things are progressing. Oh, and a clear demijohn will do just fine… opaque ones are useful for when you wish to preserve the natural colours in a beetroot wine or something similar. Thanks for this guide it was very helpful. I’m about 2 weeks into my brew and now that the fermentation has slowed I have noticed about a centimetre of sediment at the bottom. After doing some googling some people mention they use a fining agent at the end to make sure no sediment makes the bottling. Do you think this is necessary/ did you use an agent? We have never used a stabilising agent for this recipe. Just rack a couple of times before bottling, just to be sure. I wouldn’t worry too much about a small amount of sediment anyway…it wont affect the taste! I made some mead 6 years ago using my own honey from my hive at the bottom of my garden. The mead is very strong, but light and worth the wait. Hi, can this be made into fruit flavoured, how much would you add and would it change the amount of other ingredients needed. Hi Lynsie. You could try adding a handful of blackberries or blueberries. Just use less water when topping up. I have tried this , its been 2 months , was going to bottle it but held off it tastes horrid , i understand it needs to mature but there is no sweetness and it is akin to drinking some sort of cleaning chemical at this point , do i need to use finings or just bottle it and leave it the heck alone for 10 more months and hope ? Ooh, that doesn’t sound good. At two months, it’s still very young and nowhere near ready, but it definitely shouldn’t taste like a cleaning chemical. Leave it for another month or two before bottling, then stow it somewhere dark for another year. Hope you’re not too thirsty! I took a sample of mine about 10 day’s in. It was very dry and couldn’t work out wether I was tasting vinegar or just a sour taste. I was super thorough with cleaning and it hadn’t opened the demijohn at all before sampling. I used a in filtered pure honey and fresh fruit without boiling either honey or fruit. You think it’s spoiled or is there normally this kind of taste in the beginning? Hi Richard, thanks for the message. I’d leave it well alone. It still has a lot of fermenting to do, and poking around with it at this stage only risks infection. The taste profile will change over time, so I wouldn’t start panicking just yet. Time is a great healer! Hello, I’ve just made one demijohn’s worth using three cheap one pound in weight Morrisons jars of clear honey and a leftover cider yeast sachet. It has done its stuff, fermented, cleared perfectly and I’ve bottled it. ABV about 13.5%. However it tastes dreadful ! My wife won’t touch it. As someone above said, it tastes like sink cleaner, or some such stuff. Quite vinegary. Will it improve by leaving it for a year or will I be disappointed? It was quite cheap to make, about £5 in total so no qualms there, but does it actually taste richer, or sweeter if I do leave it….. or will I end up with one year old matured vinegar? This doesn’t sound good. Vinegar smells and tastes usually indicate a bacterial infection caused by dirty kit. Might be best to pour this one away. What type of Apples do you use in this please. Hi Alistair, a 50/50 mix of cooking and eating apples will do the trick. Hi Mandy, thanks for getting in touch. You should be able to get all the basics from your local (or online) home brew shop. For starters, get your hands on a demijohn, an airlock, some sterilising solution (or powder) and some yeast. For bottling, you’ll need a funnel, a section of plastic tubing and some clean bottles (with corks). Will be giving this a try in the next few days ready for Christmas in a year or two! Hi Emma. Sorry, just seen this! A lime would work, and so would a couple of oranges.